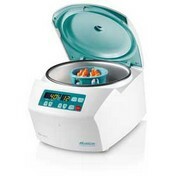 The Hettich EBA 270 is a compact tabletop centrifuge for the clinical laboratory. Ideal for the physician's office, the centrifuge comes pre-packaged with a built-in 90° horizontal rotor for blood & round bottom tubes up to 15mL. Hettich engineered to be quiet, reliable and safe. Further details can be gathered from the brochure converted into a pdf file for downloading.